Last day in Paris! Oh my…. day went by so fast! After getting ready for the day, we bought some croissants and baguette from Maison Privat again. As I mentioned in the previous entry, the croissant was really really good! Me and my hubby was fighting over it hahaha… We also bought fig baguette that was pretty unique and it tasted good too. 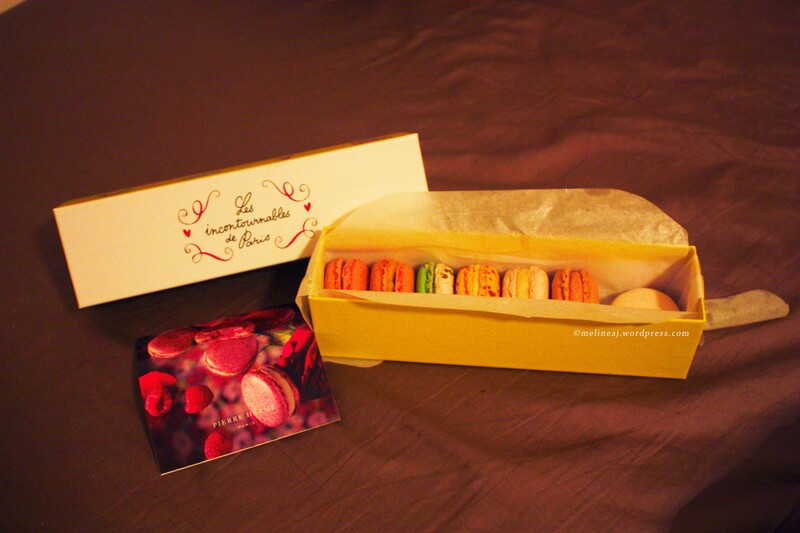 Originally, we planned to go to Sacre Coeur but we cancelled it. It was a bit farther away from our apartment and we were worried that we wouldn’t have enough time to go back to the apartment by 3pm, collect our bags, and go to the train station. 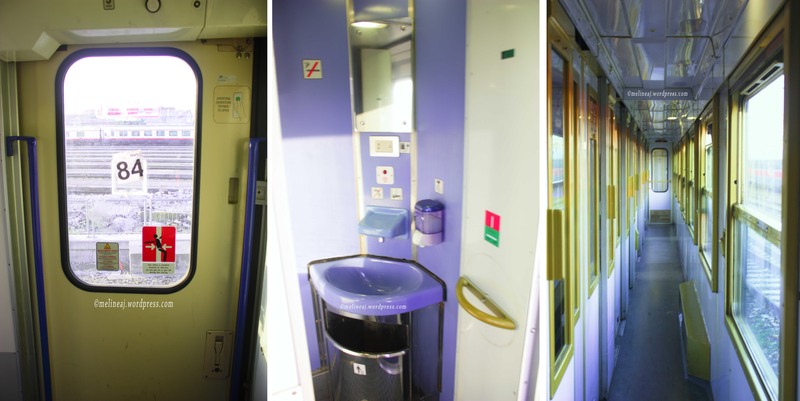 We booked online an overnight train, Thello, to go from Paris to Venice for €200 (2 people). The first destination of the day was Invalides. To channel my hubby’s passion for God of War, I agreed to visit Musée de l’Armée next to Invalides. We stopped at La-Tour Maubourg metro station and walked toward the cobble stone path leading to the museum. This was actually the back side of Invalides. If you want to visit Invalides first, I suggest you stop at Ecole Militaire metro. The admission ticket to the museum and Invalides was € 9.50 but we got a discount by owning Visite Pass, so we only paid € 7.50. 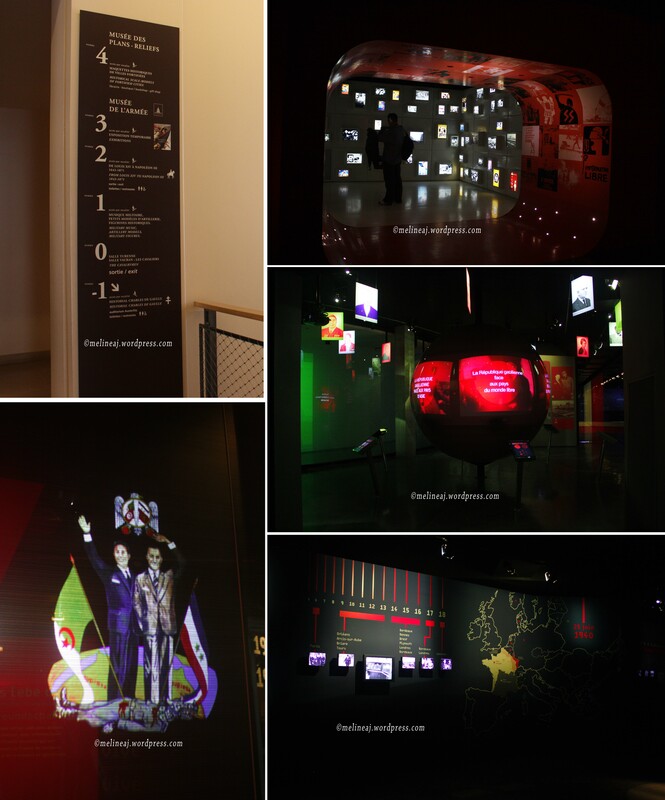 We visited the lower floor where there were cool multimedia presentations of French history. We didn’t spend too much time here since my hubby wasn’t too interested at history. 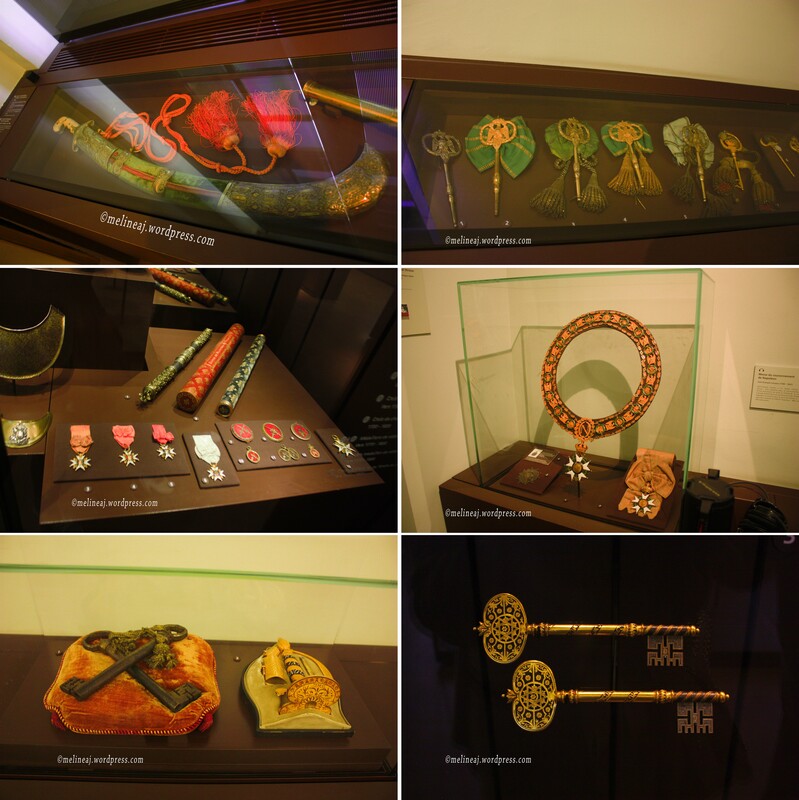 We then moved to the 2nd floor where there were tons of displays of armories (swords, pistols, bayonettes, grenades, etc) as well as French uniform and medal for the soldiers. 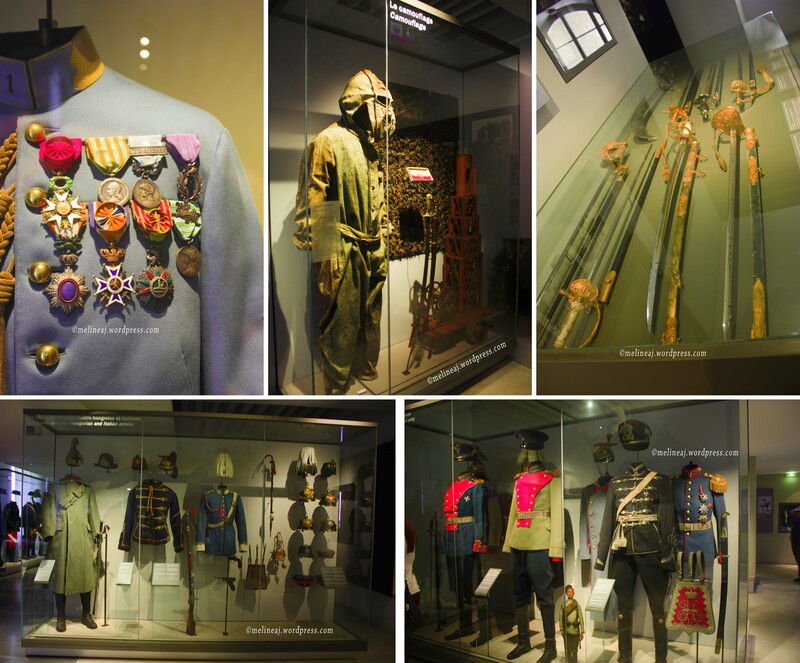 While my hubby stared at each of the swords and pistols, I was more interested in the clothing details of French uniforms. I also adore the colourful ribbons on their medals. 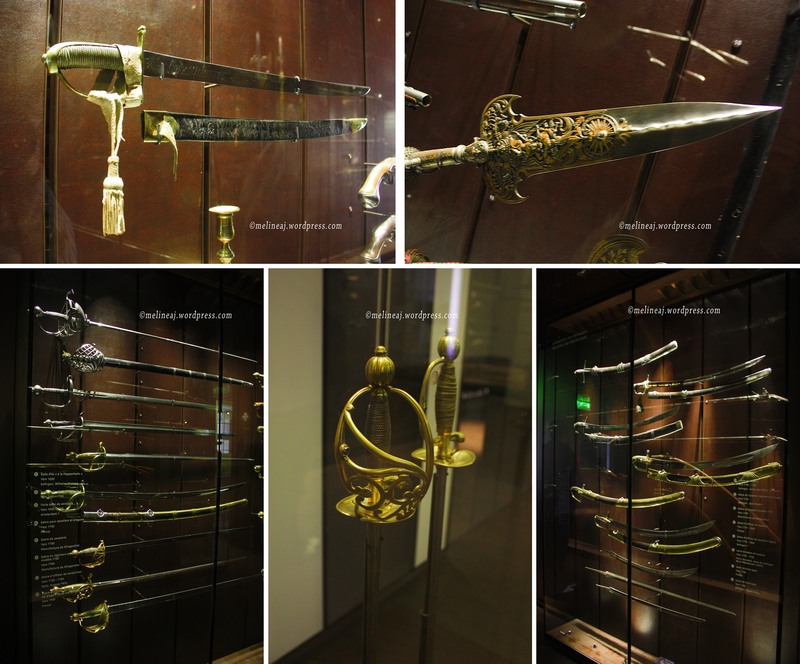 Some of the swords have a very intricate design in their handle and some even have the writing on the blade – just like in the movies! The shields were also decorated beautifully. It’s kinda sad to see these details were nearly faded nowadays. People choose function over artistic design. I wish people could combine both high technology and beautiful design in everyday life. 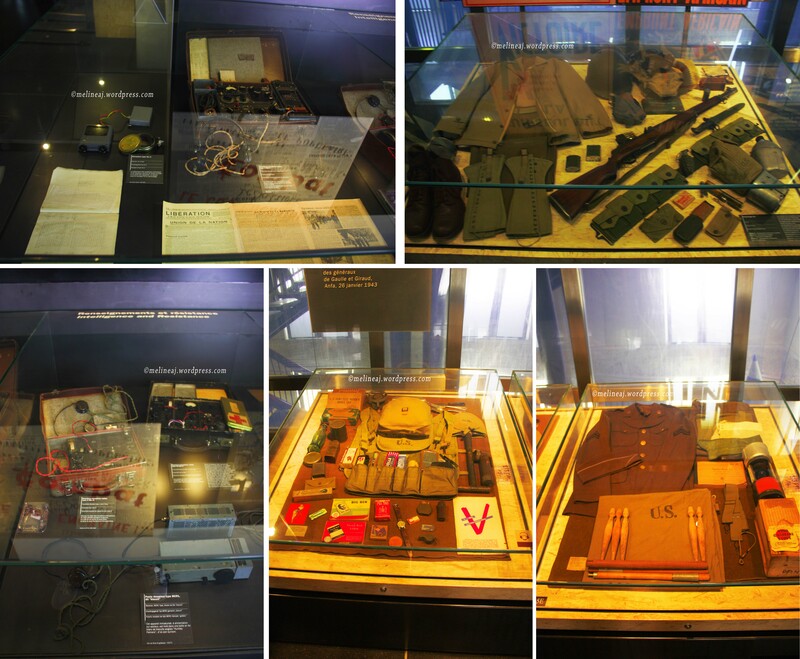 The museum continues to the 3rd floor where the World War I and II exhibit was. It even had a real gold chest shield that had been hit with bullet on display! Cool! 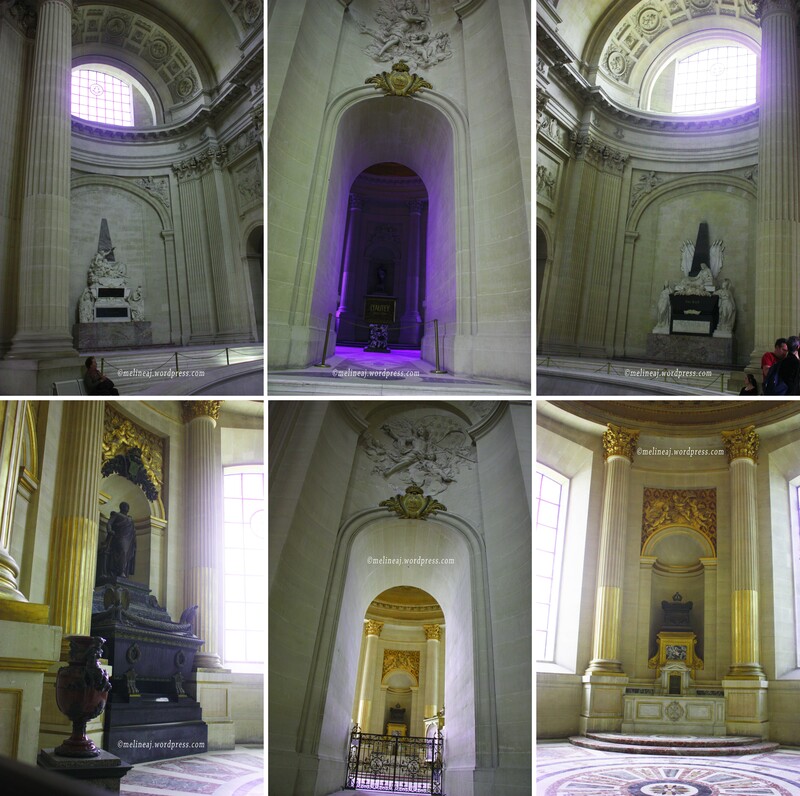 Being bored, I rushed my hubby to move on to see Napoleon’s tomb inside the Invalides. We were a bit confused about the location until we saw a lot of people walking on a small passage on the left side toward another courtyard. We saw more and more people as we walked close to the entrance of Invalides. The inside of Invalides was as great as the golden dome on top of it. 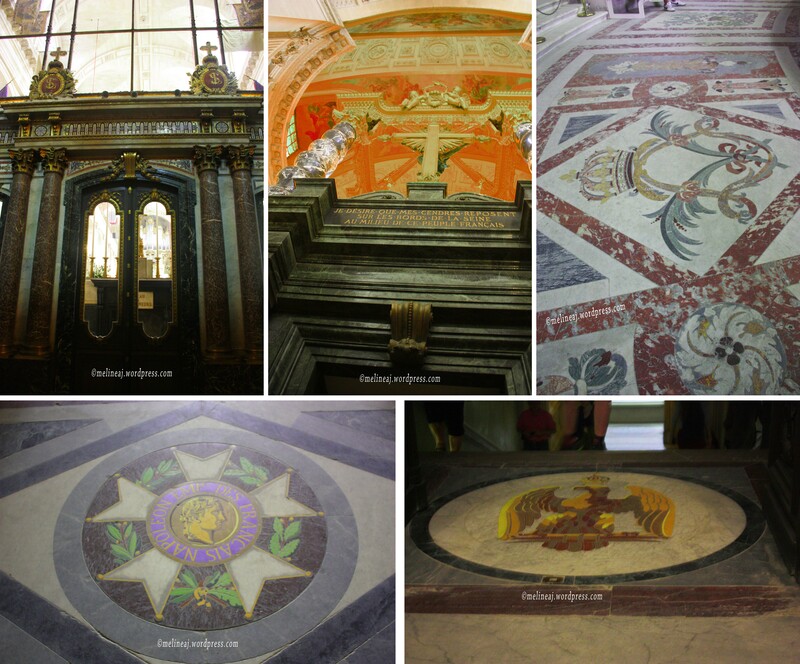 Every wall and floor was covered with marble – and it was in different colours too! As soon as we entered the building, we saw the black and gold altar at the back. There were also smaller rooms around the altar for tombs for famous peole. 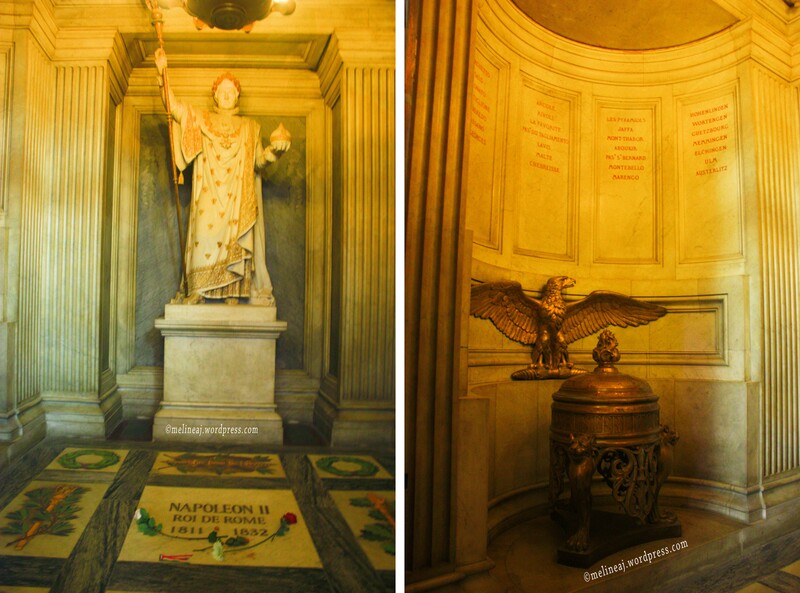 The Napoleon’s coffin was actually at the lower floor of the building. The maroon red marble was easily spotted as we walked down the stairs. Around the big coffin, the wall was covered with 3D sculpture depicting the story of French philosophy. Facing inward, there were statues of angels as the guards of the coffin. From the TV show, I remembered that the coffin was made with 7 layers from different materials to preserve his body. Entrance of the tomb: the door, the dome, the altar… super fancy and grand! 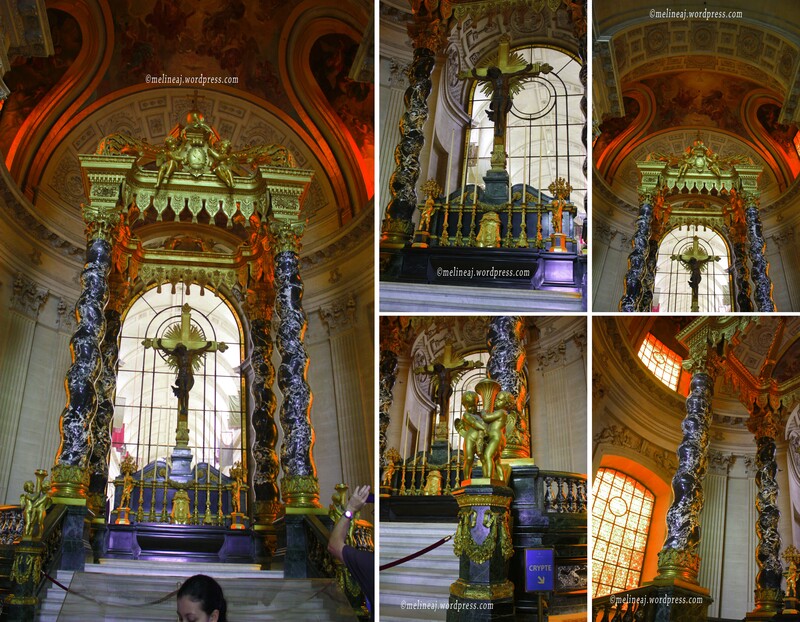 The details of the altar….. super nice! The floor is awesome too! 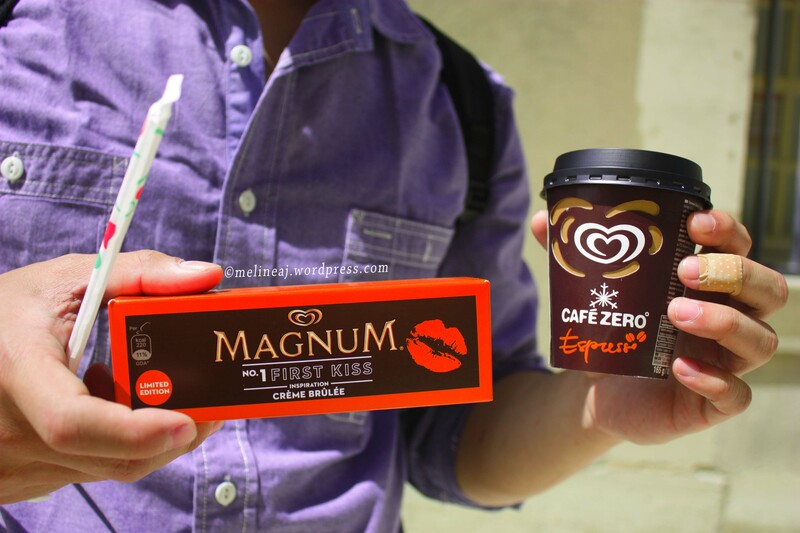 Magnum Creme brulee & Cafe zero espresso saving the -hot- day! From La-Tour Maubourg metro station, we went to Le Marais area. There are a lot of shops in this area. Some are traditional small shops and cafe and some are famous branded store like GAP, H&M, etc. We only spent a little time here, just to get the feeling of the famous shopping area in Paris. Afterward, we went to the Moulin Rouge to see the iconic red windmill (Blance metro station). This area is well known as the red district area in Paris. We took a peek at the famous cabaret place called Feerie but the show wasn’t on since it was still in the afternoon. Around this area, there were lots of restaurants and some ‘unique’ shops hahaha…. Sacre Coeur is nearby but if you do walk, this will be a bit of hiking trip since the basilica is up the hill. It was almost time to go back to the apartment so we skipped going to Sacre Coeur. After collecting our luggage, we went to Gare de Lyon using M6 metro line (Cambronne to Bercy) & changed to M14 metro line (Bercy to Gare de Lyon). This was a longer trip but it had less line changes compared to the other routes – we brought 2 big luggages and it was very inconvenient to carry them up and down the metro stairs. When we arrived at Gare de Lyon, we had to take a special train from the metro to the train station. However, there was NO clear sign pointing us to the train platform, it only showed signs with “A to Z” or “5-23.” After asking where should we go at the ticket booth, we rushed to exit #9. Again, this area was only a bunch of ticket booth. Since we already had our ticket ready, we asked one more time where our platform was. The lady in the locket said to look up at the TV monitor 20 minutes prior to our train departure! Crazy huh?! As tourists, we were totally confused and we saw another couple having the same problem too! They expected us to just rushed to the platform in ONLY 20 minutes?! How inconvenient!!! I saw a yellow Thello sign directing us to go to the upper level. Later we found out that this sign was for Thello ticketing office and vending machine. Since I was hungry, I asked my hubby to go to the upper level – which was Hall 2 where Platform 5-23 is. Here, there are lots of small shops selling sandwiches and baguette to go. We checked the monitor and it showed that our train would depart from platform 10. So, we took our time to eat and relaxed a bit. Not until 15 minutes before our departure, we found out that our train would actually depart from platform K!!!! O-M-G!!!!! What’s wrong with French trains? They’re so indecisive!!! We rushed to go to Hall 1 that was a bit walk from Hall 2. 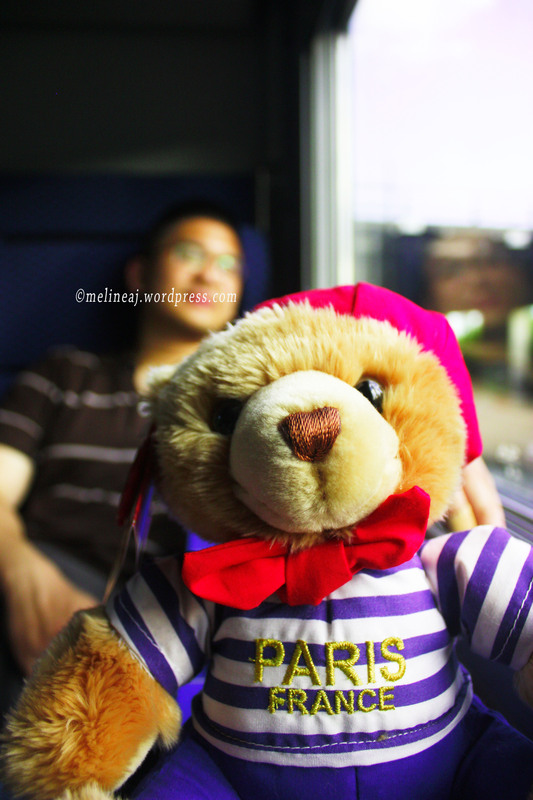 For a moment, I saw a cute teddy bear wearing Paris shirt in one of the magazine shops. Begging my hubby to stop, I bought this cute plush as the last souvenir from Paris. My hubby kept rushing me and as soon as I paid the €15 teddy bear, we sprinted and it felt like we were in an Amazing Race! 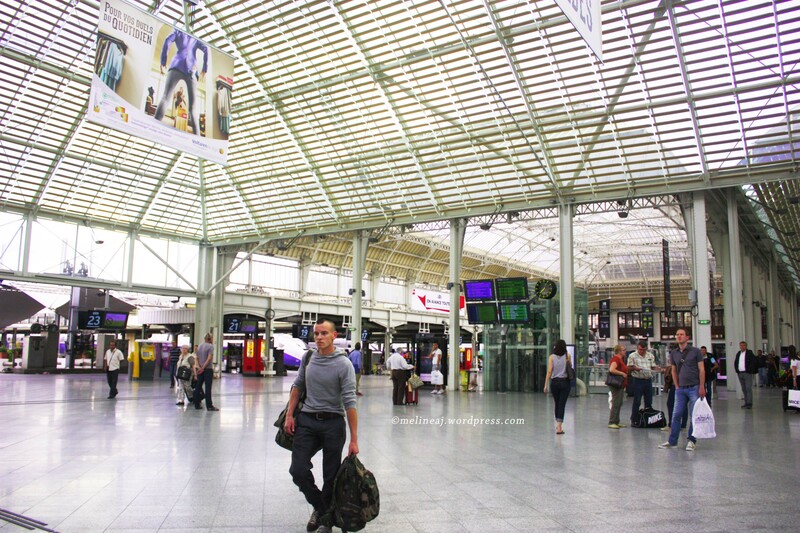 Here’s a good website explaining Gare de Lyon station. When we arrived at Hall 1, I saw the famous Le Train Bleu restaurant at the upper floor. We only took picture at the front and rushed to platform K to find our car number. See… we were pretty good runners… In only 15 minutes, we managed to buy a teddy bear and snapped a picture hahahah…. We were lucky that our car train was the second to the last one, so we didn’t have to walk too far along the platform. There was a man checking our ticket prior boarding the train car, so have your ticket ready. The ticket that we printed only showed the car# and 2-digits seating#. This 2-digit number is actually the room number and the actual seat number; for example 92 = room 9, seat 2. Important thing to remember is that the train is VERY ON TIME! It will leave whether you’re on board or not. So arrive early at the station in case you’re confused so you have extra time to wondering around. Again do NOT be late! Who can resist this cute Parisian teddy bear? Thello is an overnight train that took us 13 hours from Paris to Venice (via Milan). We chose to ride the overnight train since it would save us some money on accommodation and transportation fee. There are different options for the room with different prices for the train. The most expensive one is the exclusive one room for you. There are also 2 couchettes, 4 couchettes, and 6 couchettes room. We bought the ticket for 6 couchettes for €100 per person. We thought that there wouldn’t be enough room for my husband since he is tall but surprisingly, he slept well at the top of 3-tier bunk bed. Maybe too comfortable that he snored hahaha…. I too slept at the top of the bunk bed since the girls who we shared the car opted for the 1st and 2nd tier bed. For me, I prefer the top bunk bed than the lower ones since it has higher ceiling space so that I didn’t feel restricted. They provided bed sheet, blanket, and pillow for your convenience. The blanket was thin but it was actually very warm. The compartment is air-conditioned and there was a knob to adjust the speed of the fan. An hour into our journey, a lady with Thello uniform came to check on our ticket and passport. She took away our passports and said that she would give them back the following day at 8 am. There was a 24-hours bar and restaurant that opened until 9 pm on board. They were available after car #89. There were also 2 small washroom at the end of each car that were pretty clean. The one setback was that they didn’t provide Wi-Fi on board. Personally, I think overnight train is better than taking airplane. Basically, we could sleep throughout the journey to Venice especially after three long day of walking around Paris. If you do share a room with other people, please have some courtesy. The train itself actually stops at several stations. It also had to stop to wait for another train to pass by the track. When the Thello lady gave back our passport, she informed us that our journey would be delayed by 1 hour. However, we actually arrived at Venice as scheduled time. So yeah… just enjoy the ride!